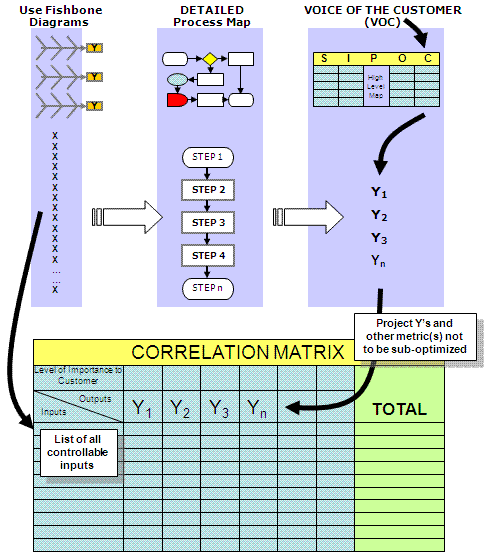 The Correlation Matrix is the second subjective screening tool to filter out lesser important process inputs from the key process input variable (KPIV's). The completion of the Fishbone Diagrams or another method of identifying all inputs to the problem is a prerequisite to this step. To screen the numerous input variables by subjective analysis using the team's knowledge and supporting data by weighing each according to their correlation to impact on the problem. The figure below shows the linkage of the commonly used subjective tools. Briefly discuss the input and its meaning so each appraiser understands. Weigh the input as it correlates to each Y, using the weighting scale the team has established. Compute the total score for each input. Sample calculation shown below. Sort the input scores in descending order. Determine cut-off point and carry these inputs to the FMEA for risk analysis. Before assigning weights, it is important to have a brief (emphasize "brief") overview and discussion of the input so everyone understands why it was identified as a root cause in the first place. This will help to get a better decision on the weighting by each person as it correlates to the problem. 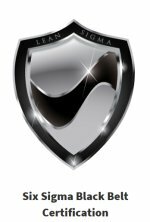 The cut-off point may be a certain score and higher OR the team may decide to focus on targeting a specific section of the detailed process map where most of the highest scores exist. There is not a specific criteria, this tool will shed light on what the cross functional team thinks are the most important inputs to improve and control that will lead to a closure in the project gap according to the contract. Shown below is a sample calculation for one input. A spreadsheet can be created to automate and sort the steps shown above. Completion of this tool must be used with a solid plan to keep it quickly progressing. It can take very long time to complete if there is not a plan to weigh each input. This is normally done in a room with everyone on the team present for cross-functional representation. For instance, if there are 50 unique controllable inputs identified from the Fishbone Diagrams and there are 4 project Y's, then there will be 200 appraisals. And if there are six people weighing in on each of those 600 scores, it can take a very long time. There should be a quick vote and the Process Owner should make the final call on the score if there are ties or disagreements. Sometimes, a column is added to indicate the EASE OF COMPLETION. Therefore, if the input gets a lower overall score but is very easy to resolve and complete, then it should be targeted and improved as part of the IMPROVE phase. These do not necessarily have to be taken to the FMEA for risk analysis. The subjective screening tools of the Fishbone Diagram through the FMEA are usually done at the same time the MSA is being completed. The MSA is more related to the GB/BB and a couple members of the team but the subjective screening tools require as much of the team as possible. 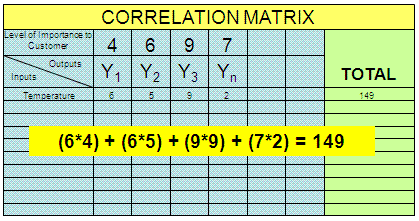 A Correlation Matrix template is available here. Plug in the x's and y's along with the weights and begin adding scores. The totals are calculated and then sort by the highest scores to see the inputs that the team subjectively determined to have the most impact on the project.